Great work on your first week of the challenge! We now have 1050+ students and 135 classes taking part in the challenge. Can you tell which new country has been added to our participant list? This week we are talking about commenting. And not just any old commenting, quality commenting. Remember, if you’re on a computer, the menu on the right sidebar will help you navigate this post. Our commenting team was very busy BUT they did run into some difficulties with leaving comments on some posts. If you can’t see the URL you submitted on the spreadsheet here or haven’t received a comment, please read this post by our commenting team leader, Miss W (Sue Wyatt). If you’re ever confused or need help, just leave a comment on one of the posts or email me. A big thanks goes to Miss W and her team of 80+ commenters! Remember to approve any comments you receive in a timely manner and write a polite reply. With so many amazing posts and pages written last week, it was hard to choose just a handful to showcase. Mrs. Yollis is a role model blogger from California, USA. Her students are setting up their own blogs with Edublogs for the first time (they are using pen names). Check out this great avatar post from “Jodie Bloom”. This enthusiastic blogger also shared a diagram to explain the visual editor in her blog’s dashboard. Livy made a fun avatar post and then decided to write about an interesting museum in California. Check out the sidebar of Mrs. Yollis’ class blog for more student blogs. Don’t you love the way they’re ending their posts with questions? Have you ever heard of a country called Kazakhstan? Meet Mrs. Matveyeva’s class and learn about their interesting country. Her students would love you to comment. Allie in New Zealand wrote a wonderful About page and included a cute watermelon avatar. Cora from the US updated her About page and it includes some fun facts in a nicely presented format. Aleira from Australia wrote her About information as a post. If you’re into dance, music, gymnastics, circus, or traveling, you might like to stop by and say hi. Jemimah from Australia put together a wonderful A-Z post to tell us all about herself. Ash Eryn from the Philippines (a regular STUBC participant) introduced herself in a poetic way. Faye’s grade 8 class from India would like you to leave a comment and say hi. The Fabulous 4MM are new bloggers from Australia. They put their avatars together in a great slideshow. Learn more about this class by visiting their About page. They’d love to hear from you. Flipboard — Sharing more great work! Flipboard is a digital magazine that brings together stories and articles from the web. You can use Flipboard on your computer, or via the app on your phone or tablet. 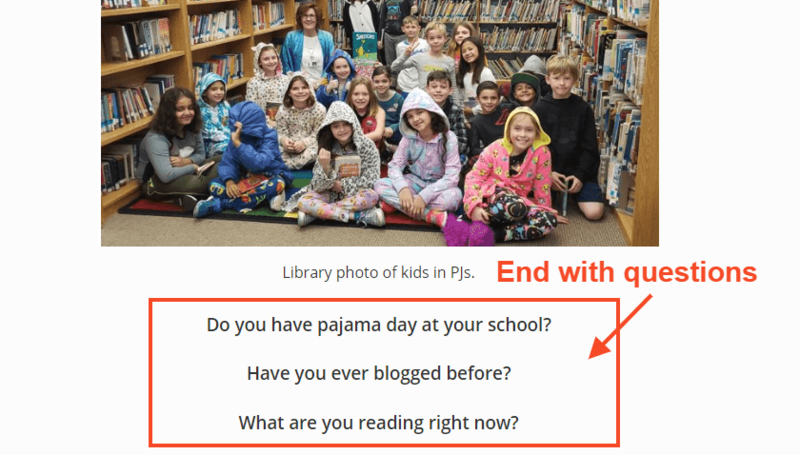 Click here to view the new 2019 Student Blogging Challenge Flipboard. Our commenters will be adding some notable posts and pages to the magazine over the coming weeks. If you didn’t read the reminder post published in late February, please check it out here. The two most important reminders this week are making sure people can view your blog and comment. Is your blog password protected? To take part in the challenge you need to make sure that visitors can view your blog without signing in. Teachers, if you have student blogs, you don’t need to do this individually. In your blog dashboard, go to My Class > Settings and choose one of the public options as per the image above. Using a different blogging platform? Check out this reminder post which has links to the help guides you need to change your settings. Can people comment on your blog? Some blogs don’t allow comments on posts or pages or they need visitors to log in before commenting. If you’re using Edublogs/CampusPress, go to settings > discussion and ensure you don’t have “Users must be registered and logged in to comment” selected. Pages on Edublogs/CampusPress blogs are turned off by default. Some people don’t like comments on pages but you will need comments enabled if you’re submitting a page as a task. Find out how to enable comments on pages here. If you’re using Google Sites, make sure it’s easy for people to leave a written comment. Some students only had the option to leave a voice comment. Before we look at quality commenting, let’s revise the basics of how to comment. This Google Slides presentation might be useful to use in the classroom with beginner bloggers. It explains how to comment on Edublogs or CampusPress blogs. Using a different blogging platform? Maybe you could make your own slideshow and share it with us for this week’s second task option! What’s so special about commenting? Why not just publish blog posts? Comments turn your blog from a static space to an interactive space. This means it’s not just you talking. There is interaction. Back and forth conversations are fun and you can learn a lot. Because comments are not instantaneous (like online chat or text messaging), you can have more time to reflect, research, or think about your response. When someone leaves a comment, they can leave feedback, constructive criticism, or give you new ideas. This can help you grow and learn. A commenter might suggest something that you didn’t include in your post. You can learn new perspectives. When you have an authentic (real) audience, it’s more motivating! You know someone will read your post, so you will probably put more effort into it than if you were just writing something in a notebook. 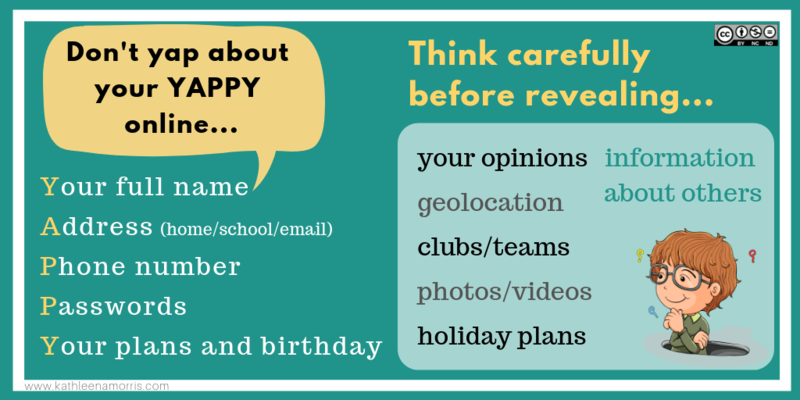 Commenting can be an ideal way for busy parents to get involved in the classroom. You can learn how to interact politely and how to have conversations. You can meet new people and form friendships. Students who don’t have their own blogs can enjoy the benefits of blogging by being a participant in the comment section. Could you add anything to this list? Tell us in a comment! Which of these comments do you think is better? Some students are young, learning a language, or just starting out and no one expects students (or teachers!) to be perfect. However, when we aim to do certain things in our comment, we will learn more and develop skills that we can use in all areas of our life. We’ll also have a better chance of forming strong connections with others. So what makes a quality comment? Here are some ideas. You might have your own ideas. Written like a letter with a greeting, body, and sometimes a closing. Correct spelling, grammar, punctuation, and spacing. Questions, compliments, and/or relevant new information. Making connections without revealing personal information like surnames, addresses, birthdays etc. You won’t always include all of the above in your comments but these are the sorts of things you might aim for. This is a video about quality commenting that Linda Yollis made with her third-grade students back in 2010! Many classes still enjoying viewing it. For older students, this video by Nicolas Weiss is popular. Sling’s 7/8 class in Canada created this must-watch video on commenting during the last Student Blogging Challenge. When someone leaves a comment on your blog, it won’t show up straight away (unless you have turned off moderation in your settings which is not recommended). Whoever has permission (teacher/student) will need to approve the comment first. 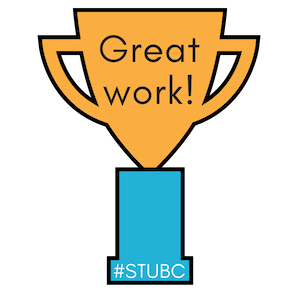 Try to approve comments quickly, especially during the Student Blogging Challenge. If you’re using Edublogs or CampusPress, check out Comments Overview and Managing Comments. If you’re using Blogger, check out Manage Your Blog Comments. If you’re using Kidblog, check out Approving Comments. This week there are four tasks to choose from to help you learn more about commenting. Here is a summary. I will explain each task in more detail below with some examples and ideas for how classes can approach each task. How would you like people to write their comment on your blog? This task involves coming up with your own commenting guidelines. 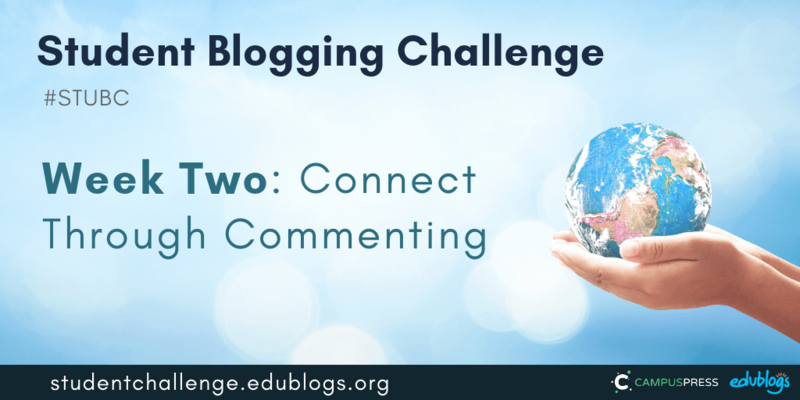 You can put your commenting guidelines in a post, but they might be better suited to a page (find out how to allow comments on pages using Edublogs). You can just write your guidelines down as text or make some sort of poster, graphic, or slideshow. If you’re working as a class on this activity, you could come up with your guidelines together and all the students could make a graphic or poster to share on a page (or a series of posts). Perhaps a small group of students could illustrate one step each. Or the teacher can make the page and the students can comment on it. You might make a How To Write A Quality Comment poster like I did below. Teachers, if you want to use this poster for your own class blog, feel free. You can grab a PDF copy here. If you want to make your own poster, try a tool like Canva, Adobe Spark, Google Drawings, or even PowerPoint. Of course, if you make your own poster, please personalise it and don’t copy my exact wording. Check out the creative way Mrs. Vazquez made a commenting poster using a web tool called Thinglink. If you hover over the blue circles you’ll find more information. Aubrey shared some examples on her page to explain what sort of things make a quality comment. Caleigh made a mind map to share key ideas. Rajyashori used emojis to explain her commenting guidelines. Many themes and blogging platforms have different ways to leave a comment. You might need to click on the title of the post, or click on a number in a circle, or click on the words ‘Leave a comment’. This task involves writing a page (or post) for your blog explaining how to leave a comment. (Remember, if you change themes in future, you might need to change your instructions). You could write it as a set of steps or perhaps create a video showing what to do. Alternatively, make a slideshow like the one I shared in this post. If you’re working as a class on this activity, you could come up with your instructions together and all the students could make a graphic, poster, or video to share on a page (or a series of posts). Or the teacher can make the page and the students can work on other activities. Here’s a quick video I once made for my colleague’s class blog. I used a free Chrome extension called Screencastify to make the video above. Loom is another good tool for making screencast videos if you use the Chrome browser. Tip: Find out how to add a video to an Edublogs or CampusPress blog here. Need Pro? If you have a free Edublogs blog, you won’t be able to embed the video into your post or page. This is to prevent misuse by spammers. Contact me to get a free upgrade to Pro for the duration of the challenge. Cassidy made a great screencast video for her post on how to comment. Jena made a commenting information page that includes how to comment instructions and guidelines. Chris’s distinctive writing voice shone through on his commenting guidelines page. Janae turned her commenting guidelines into a poster which she added as an image to a page. The McDowell Media students made some great how-to videos to let everyone know how to comment on their blog. 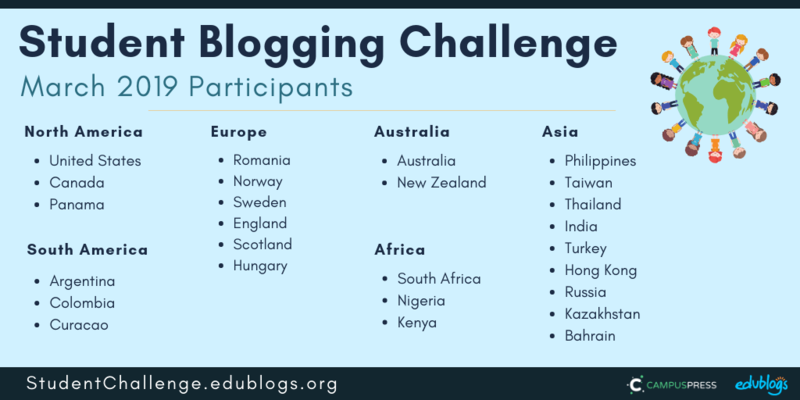 This is a task for bloggers who are after a challenge! HTML is a computing language for making blogs and websites. If you’re using Edublogs/CampusPress and you switch from Visual to Text in your post editor, you’ll see the HTML code that makes up your post. Mrs. Yollis includes a page on her blog with some HTML code you can use when commenting. Here is another post explaining how to use HTML by Tech Superpowers. 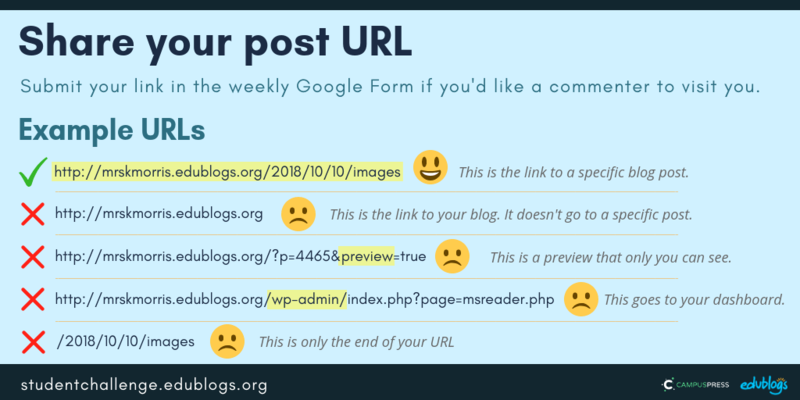 If you want to leave a link to your blog that looks neat and tidy, check out this post. The instructions below show you how to use bold, italics, and add a link. Remember, coding is about troubleshooting. So if something doesn’t work, take a closer look at your code. Maybe you’ve added a space or missed a symbol. Visit one of the participants’ blog posts then write a post telling everyone about the HTML you used. You might make your own tutorial for others. Tip: If you want to include a demonstration of HTML code in a blog post, it can be best to write it in another program like Word, Google Docs etc. and take a screenshot of the code. Then insert the screenshot into your post like any other image. 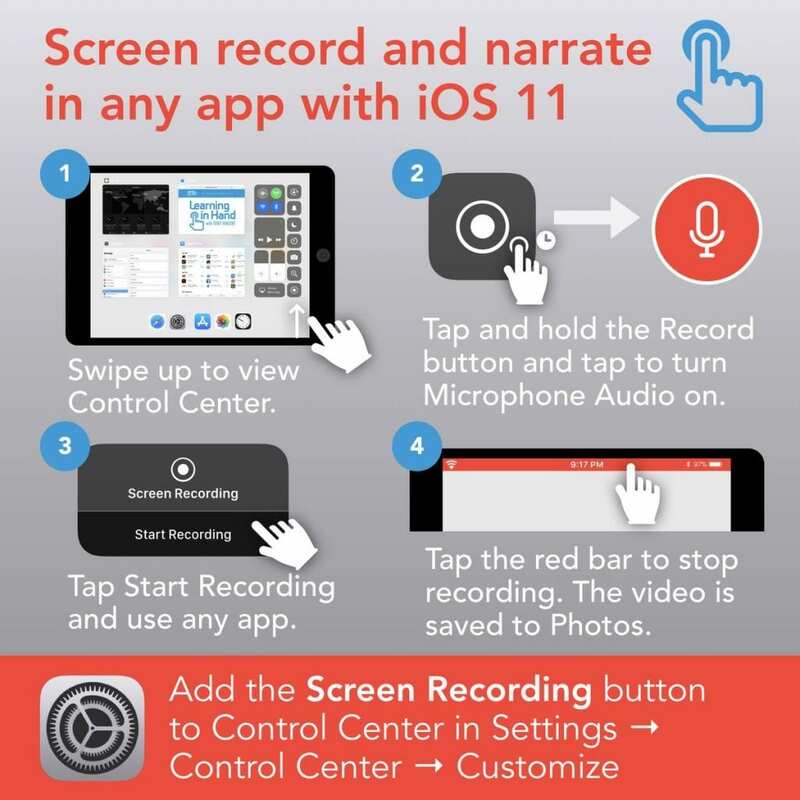 This article shows how to take a screenshot on any device. Click here to find out how to add an image to an Edublogs or CampusPress blog. If you’re working as a class on this activity, you could try leaving some comments with HTML as a whole class activity. Or perhaps the teacher can publish a post with instructions for HTML and the students can leave a comment trying out some codes. We know the benefits of commenting, so let’s leave some comments! Find three or four blogs you’d like to leave a comment on. Check out the green week one list or purple week two list on the sidebar. These are the lists of students and classes who have submitted a task so far. 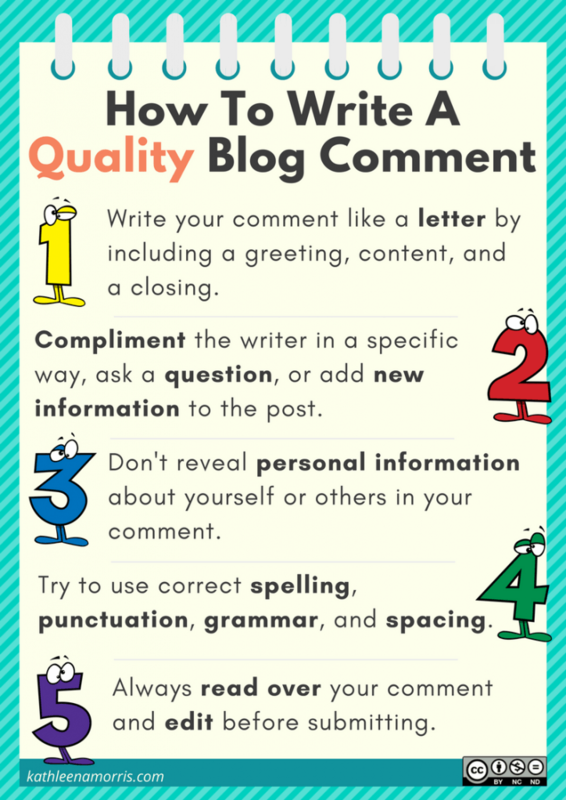 Leave a quality comment on one post on each blog. Write a post on your blog mentioning who you visited, which post you left a comment on and why, then include the comment you left. Include a link to the blogs you commented on too. Hint: make sure you copy the comment or take a screenshot before you hit the submit button. Figgy wrote a post telling us about the comments she left on other blogs and included the links. 12th grader Rheinhard reflected on commenting in this well-written post. Rajyashori from India shared some of the great comments she left on various blogs in this reflective post. Ms. Blessings’ grade two/three students shared some examples of the comments they left during the last challenge. If you’re working as a class on this activity, you could try leaving some comments as a whole class activity. Or perhaps each student could leave a comment on a different blog and write about the experience. The students’ writing could be compiled into one post or multiple blog posts. A great way to encourage your visitors to comment on your post is to ask a couple of questions at the end of the post. You might make these bold or coloured so they really stand out. Try using open-ended questions. So, instead of saying, “Do you have a dog?”, you might say, “Please comment and tell me about your favourite animals”. Examples: Ending with questions is something Mrs. Yollis’ students are doing really well. Have a look at some of their blog posts for inspiration (links on their sidebar)! If you’re new to blogging, try this later on! Will visitors to your blog find it easy to search for a post they might be interested in commenting on? If you use Edublogs or CampusPress, maybe you need to start using categories? You can also use tags once you get the hang of it. Start with categories. If you use Blogger, try using labels. Kidblog blogs also use categories and tags. Categories, tags, or labels are all ways to organise your posts. 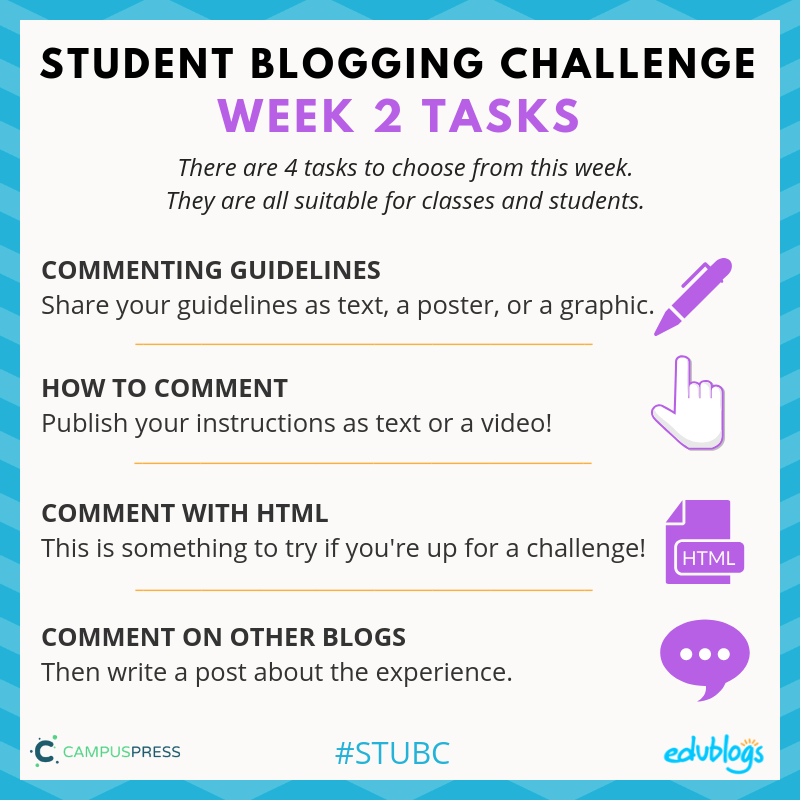 It’s a good idea to set up a category (or label in Blogger) called Student Blogging Challenge or STUBC. You can assign this category to all the posts you write for the challenge. Remember when you’re commenting or writing posts, don’t yap about your YAPPY! If you want a commenter and other participants to visit your blog, remember to fill in the form below for the post you publish about your week two task. You need to submit the URL of your post. You can submit the URL of a page if this is what you’re working on but make sure comments are enabled. Flipboard -- Sharing more great work! « Commenting team have started but …. I am excited to start the fun with photos for week 3! I have always liked pictures! Me too, Josiah! Pictures can really tell 1000 words, can’t they!